Bob gives us a great view and demonstration of the drive assembly on this 2013 Street Bob. This drive assembly has changed tremendously over the years but the concept has remained the same. Although there have been improvements and upgrades made to this assembly, Harley has left us with a weak Harley clutch basket. This basket is made of cast aluminum that has been proven to crack and leave large chunks of aluminum in the primary case. When a piece of the basket breaks off it can be dangerous to the rider. It will also destroy everything inside the drive. Everything will need to be replaced and this can be quite expensive. Barnett Engineering has studied this this problem and has developed the ultimate Harley clutch basket replacement. Barnett’s basket is made to handle the harsh conditions or abuse that this drive is subject to. 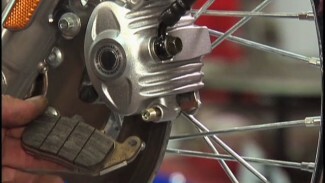 It withstands the most extreme conditions where the stock Harley clutch assembly falls short, or down right fails. Before installing the Barnett assembly, we have to get into this drive and put the stock assembly on the bench. As usual, Bob starts with the battery negative cable disconnected and the drive, drained. It is always a good idea to let the drive compartment drain overnight, if possible. This helps you to work cleaner, without so much residual oil hanging around. Next, remove the outer primary cover & gasket and slacken the clutch cable. 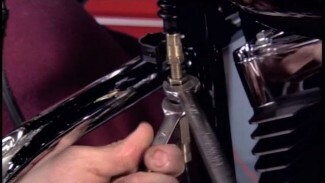 Loosen the jam nut and back off on the Harley clutch adjustment at the clutch pack. Remove the adjuster plate retaining clip to expose the mainshaft/clutch hub nut. Now is a good time to sneak a long tie wrap around the primary chain adjusting shoe. Loosen the mounting hardware evenly and remove. 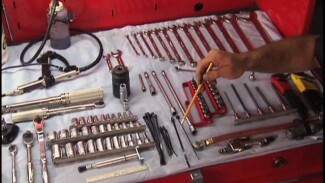 Use a drive locker and a breaker bar to loosen the compensator bolt and the mainshaft nut. Remember, the mainshaft nut is left hand thread. This means- right is loose and left is tight. Carefully remove the entire sub assembly and lay it on a clean area on the bench. If you are doing the Barnett upgrade, it is clear to see the drastic difference between the stock Harley clutch basket and the Barnett basket. In our next video, we will head to the bench (and the hydraulic press) to break this assembly down further.